As some of you may know last Tuesday was International Free pancake day at ihop. Well afterschool a couple friends and I went to there to commemoration this international holiday (even though I don't like ihop it was nice talking with my friends) Well the Shriners( the elderly men who drive in the small cars) run the free pancake day, so they were there opening the doors for everyone welcoming us. 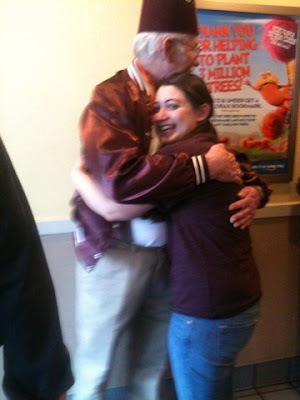 My friend Madison has this "obsession" or love for old men,infact last football season for our secret sister gives I put a picture of an oldman on each of her gifts, so of course she had to get a hug from on of the shriners! They were actually really happy she gave them a hug so that was cool. and the pancakes were good as well! By the way I want to apologize for all the bad photographs I never have my camera on me so I just use my phone which doesn't take very clear pictures so sorry!